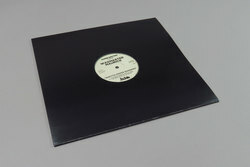 Waxmaster Maurice - Ghetto House Bangers. Vinyl EP. Bleep. A real coup for the Super Rhythm Trax crew here. Many of the label’s previous releases owe a debt to the legendary Dance Mania, so to have one of the imprint’s OG producers step up to the plate for a SRT drop is a real cause for celebration. Of course, Waxmaster Maurice does not disappoint. On Ghetto House Bangers the Chicago producer serves up track after track of hi-energy jukin’ club tackle.